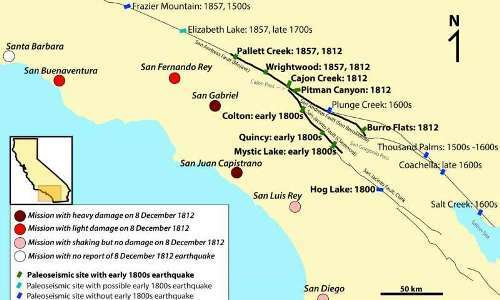 An assistant researcher professor with California State University has found evidence that the powerful quake that struck southern Californian back in 1812 may have been precipitated by a fault line other than the San Andreas. In his paper published in the journal Science Advances, Julian C. Lozos describes a computer model he created using real world data, what it showed, and why his findings suggest that a future double earthquake could occur someday in the area. Back in 1812 a major earthquake struck southern California near what is now San Bernardino—modern study of damage from the quake suggested it was approximately a magnitude 7.5 quake. There was little damage because there were few structures in the area back then, though approximately 40 people were killed when a church they were in collapsed. For many years, Earth scientists have assumed that the quake was due solely to activity along the San Andreas Fault. In this new effort, Lozos suggests that the quake may have actually been set off by a quake along the San Jacinto fault line. Lozos’ findings are part of a study that included field trips to several sites in an area where the San Andreas Fault and the San Jacinto Fault nearly merge. While there, he found evidence of three strands—where sections of fault are separated by bits of crust that has remained intact—one near the San Andreas fault and two near the San Jacinto fault. Each strand is evidence of an earthquake, but reports from people in the area suggest there were only two earthquakes during the time period under study—in 1812 and 1800, which suggested that one of the strands on the San Andreas Fault and one on the San Jacinto Fault were evidence of the same quake. Lozos also looked at other data collected by other researchers doing working on faults in the area—all of it went into a model he built to describe seismic activity in the area surrounding the time frame of the 1812 quake. The model showed that the most likely scenario that could account for the data that has been collected was that a quake had occurred along the San Jacinto fault line and as it made its way near the San Andreas fault line, the disruption caused a quake to occur along that fault line as well. Lozos is quick to point out that his model is just that and that thus far he has no evidence to suggest that such a double quake is imminent, but he also notes that if it happened before, it could happen again, noting that southern California is long overdue for a pretty big tumbler. One of the main predictions of the current model of the creation of structures in the universe, known at the Lambda Cold Dark Mattermodel, is that galaxies are embedded in very extended and massive halos of dark matter that are surrounded by many thousands of smaller sub-halos also made from dark matter. Around large galaxies, such as the Milky Way, these dark matter sub-halos are large enough to host enough gas and dust to form small galaxies on their own, and some of these galactic companions, known as satellite galaxies, can be observed. These satellite galaxies can orbit for billions of years around their host before a potential merger. Mergers cause the central galaxy to add large amount of gas and stars, triggering violent episodes of new star formation ?known as starbursts? due to the excess gas brought in by the companion. The host’s shape or morphology can also be disturbed due to the gravitational interaction. Smaller halos form dwarf galaxies, which at the same time will be orbited by even smaller satellite sub-halos of dark matter which are now far too tiny to have gas or stars in them. These dark satellites therefore are invisible to telescopes, but readily appear in theoretical models run in computer simulations. A direct observation of their interaction with their host galaxies is required to prove their existence. Laura Sales, an assistant professor at the University of California, Riverside’s Department of Physics and Astronomy, collaborated with Tjitske Starkenburg and Amina Helmi, both of the Kapteyn Astronomical Institute in The Netherlands, to present a novel analysis of computer simulations, based on theoretical models, that study the interaction of a dwarf galaxy with a dark satellite. The findings were outlined in a just-published paper, “Dark influences II: gas and star formation in minor mergers of dwarf galaxies with dark satellites,” in the journal Astronomy & Astrophysics. 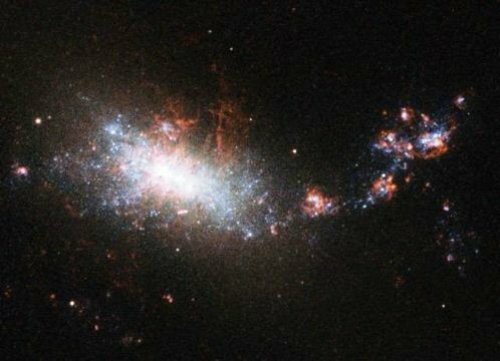 The researchers found that during a dark satellite’s closest approach to a dwarf galaxy, through gravity it compresses the gas in the dwarf, triggering significant episodes of starbursts. These star forming episodes may last for several billions of years, depending on the mass, orbit and concentration of the dark satellite. This scenario predicts that many of the dwarf galaxies that we readily observe today should be forming stars at a higher rate than expected –or should be experiencing a starburst– which is exactly what telescope observations have found. A group of researchers using the Suprime-Cam instrument on the Subaru Telescope has discovered about 80 young galaxies that existed in the early universe about 1.2 billion years after the Big Bang. The team made detailed analyses of imaging data of these galaxies taken by the Advanced Camera for Surveys (ACS) on the Hubble Space Telescope. At least 54 of the galaxies are spatially resolved in the ACS images. Among them, eight galaxies show double-component structures (Figure 1) and the remaining 46 seem to have elongated structures (Figure 2). Further investigations using a computer simulation revealed that the observed elongated structures can be reproduced if two or more galaxies reside in close proximity to each other. These results strongly suggest that 1.2 billion years after the Big Bang, galactic clumps in the young universe grow to become large galaxies through mergers, which then cause active star formation. 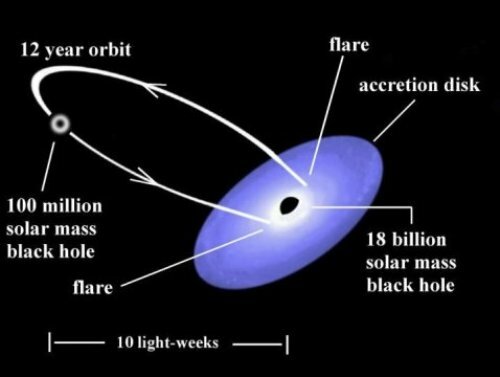 This research was conducted as part of the treasury program of Hubble Space Telescope Cosmic Evolution Survey (COSMOS). The powerful survey capability of the Subaru Telescope provided the essential database of the candidate objects in the early universe for this research project. In the present universe, 13.8 billion years after the Big Bang, there are many giant galaxies like our Milky Way, which contains about 200 billion stars in a disk a hundred thousand light years across. However, there were definitely no galaxies like it in the epoch just after the Big Bang. Deciphering compact galaxies in the young universe. Much effort has been made through deep surveys to detect active star-forming galaxies in the young universe. As a result, the distances of the earliest galaxies are now known to be at more than 13 billion light years. We see them at a time when the age of the universe was only 800 million years (or about 6 percent of the present age). However, since most of the galaxies in the young universe were quite small, their detailed structures have not yet been observed. Exploring the Young Universe Using Subaru Telescope and Hubble Space Telescope. While the wide field of view of the Subaru Telescope has played an important role in finding such young galaxies, the high spatial resolution of the Hubble Space Telescope (HST) is required to investigate the details of their shapes and internal structures. The research team looked back to a point 12.6 billion years ago using a two-pronged approach. The first step was to use the Subaru Telescope in a deep survey to search out the early galaxies, and then follow that up to investigate their shapes using the Advanced Camera for Surveys (ACS) on board the HST. The ACS revealed eight out of 54 galaxies to have double-component structures in which two galaxies seem to be merging with each other, as shown in Figure 1. Then a question arose as to whether the remaining 46 galaxies are really single galaxies. Here, the research team questioned why many of these galaxies show elongated shapes in the HST/ACS images (Figure 2). 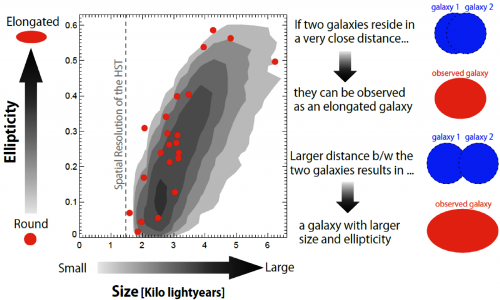 This is because such elongated shapes, together with the positive correlation between ellipticity and size (Figure 3), strongly suggest a possibility that two small galaxies reside so close to each other that they cannot be resolved into two distinct galaxies, even using ACS. If this idea is valid for the galaxies that appear to be single, then it’s possible to assume that the galaxies with the highest rate of activities have the smallest sizes. This is expected because the smallest sizes imply the smallest separation between two merging galaxies. If this is the case, such galaxies would experience intense star formation activity triggered by their mergers. The research team has confirmed that the observed relation between star formation activity and size is consistently explained by the team’s idea. To date, the shapes and structures of small young galaxies have been investigated by using ACS on HST. If a source was detected as a single ACS source, it was treated as a single galaxy and its morphological parameters were evaluated. This research suggests that such a small galaxy can consist of two or perhaps, more interacting/merging galaxies located so close together that they cannot be resolved by even the high angular resolution of the ACS. Current galaxy formation theories predict that small galaxies in the young universe evolve into large galaxies via successive mergers. What is the next step in observational studies for galaxy formation in the young universe? This is one of the frontier fields that requires future “super telescopes,” e.g. the Thirty Meter Telescope (TMT) and the James Webb Space Telescope (JWST). They will enable the next breakthroughs in the study of early galaxy formation and evolution. Supervolcanoes capable of unleashing hundreds of times the amount of magma that was expelled during the Mount St. Helens eruption of 1980 are found in populated areas around the world, including the western United States. A new study is providing insight into what may happen when one of these colossal entities explodes. The research focuses on the Silver Creek caldera, which sits at the intersection of California, Nevada and Arizona. When this supervolcano erupted 18.8 million years ago, it flooded parts of all three states with river-like currents of hot ash and gas called pyroclastic flows. These tides of volcanic material traveled for huge distances — more than 100 miles. 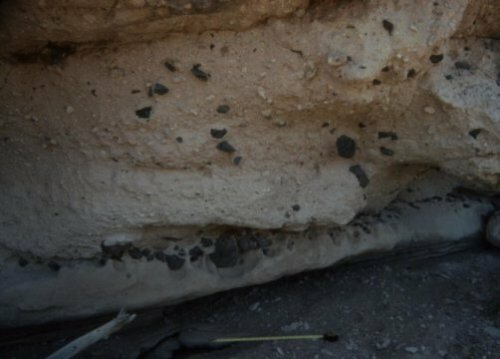 The new study suggests that pyroclastic flows from the ancient eruption took the form of slow, dense currents — and not fast-moving jets as some experts previously thought. The research combines recent laboratory experiments with field data from the 1980s — some of it captured in colorful Kodachrome slides — to show that the rivers of ash and gas emanating from the Silver Creek caldera likely traveled at modest speeds of about 10 to 45 miles per hour. 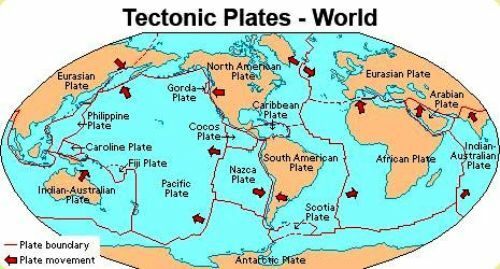 The research was conducted by Roche at Blaise Pascal University in France, David C. Buesch at the United States Geological Survey and Greg A. Valentine at the University at Buffalo. It will be published on Monday, March 7 in Nature Communications. Research on pyroclastic flows is important because it can help inform disaster preparedness efforts, says Valentine, a UB professor of geology and director of the Center for GeoHazards Studies in the UB College of Arts and Sciences. The new study favors one of two competing theories about how pyroclastic flows are able to cover long distances. One school of thought says the flows should resemble turbulent, hot, fast-moving sandstorms, made up mostly of gas, with few particles. The other theory states that the flows should be dense and fluid-like, with pressurized gas between ash particles. The new research supports this latter model, which requires sustained emissions from volcanoes, for many pyroclastic flows. The findings were based on two sets of data: results from recent experiments that Roche ran to simulate the behavior of pyroclastic flows, and information that Buesch and Valentine gathered at the Silver Creek Caldera eruption site in the 1980s when they were PhD students at the University of California, Santa Barbara, supplemented by some more recent fieldwork. “I always tell students that they should take good notes while they’re working in the field, because you never know when it could be useful,” says Valentine, who has a fat binder full of Kodachrome slides showing images he snapped around the Silver Creek caldera. The data that he and Buesch collected included photographs and notes documenting the size, type and location of rocks that were lifted off the ground and moved short distances by pyroclastic flows during the ancient eruption. Many of the rocks the pair observed were relatively large — too large to have been shifted by sandstorm-like pyroclastic flows, which do not pick up heavy objects easily. Denser flows, which can move sizable rocks more readily, likely accounted for the rock patterns Buesch and Valentine observed. To figure out how fast these dense flows may have been moving when the Silver Creek caldera erupted 18.8 million years ago, the team relied on a model developed by Roche through experiments. In his tests, Roche studied what happened when a gas and particle mixture resembling a dense pyroclastic flow traveled across a substrate of beads. He found that faster flows were able to lift and move heavier beads, and that there was a relationship between the velocity of a flow and the weight of the bead it was capable of lifting. Based on Roche’s model, the scientists determined that the ancient pyroclastic flows from the supervolcano would have had to travel at speeds of about 5 to 20 meters per second (10 to 45 miles per hour) to pick up rocks as heavy as the ones that Buesch and Valentine saw. It’s unlikely that the flows were going much faster than that because larger rocks on the landscape remained undisturbed, Valentine says. The findings could have widespread applicability when it comes to supereruptions, says Valentine, who notes that patterns of rock deposits around some other supervolcanoes heavily resemble those around the Silver Creek caldera.